Muscatine Community Schools have been exploring several long-term options to provide the most efficient and effective education for our students. The study has centered around a reconfiguration of buildings and use of buildings. No official action has been taken but the process is moving to a recommendation. The following FAQ (Frequently Asked Questions) is a communication tool to help provide background and answers to questions for our community. 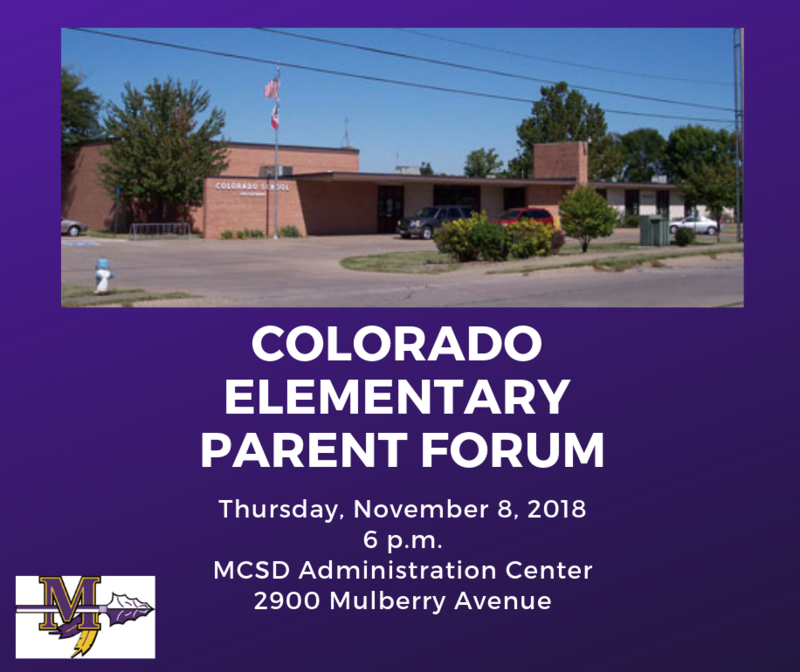 A question and answer session will be held at 6 p.m. on Thursday, November 8, 2018 at the District Administration Center, 2900 Mulberry Avenue, for any Colorado parents wanting additional information. Q1. Why is the district looking to make these changes? A1. There are several factors that have led the district to explore different education delivery systems. First, the district enrollment has decreased 685 students since 2000. This creates a continuing need to find the most efficient ways of providing an education for our students. In today’s dollars that is a loss of nearly $4.6 million dollars. In order to maintain programs and offerings to students at the current level, the district needs to find ways to become as efficient as possible. Second, the age of our buildings requires the district to look long-term at usage and management of facilities. With the exception of Jefferson, MCSD’s elementary buildings average 60+ years old. Central Middle School was built in 1938 and West Middle School in 1960. Buildings do not last forever and the district needs to be proactive in order to maintain options for the future. The idea of keeping sixth graders in the elementary buildings has been a conversation in the community for some time. The more nurturing environment of an elementary building may give sixth graders time to transition to the adolescent world. It needs to be noted, that our current middle school teachers have worked very hard to make the experience as positive as possible for our students. The question is not in teacher capacity but in the system’s structure. Finally, the prospect of having a consolidated early childhood center for our 3 and 4-year-old programs with possible wrap around care, would be of benefit to families, the district, and the community. The district is very proud of the MCSD preschool programs located in our buildings. However, programs spread across five buildings make it difficult to provide the special services that would benefit our smallest Muskies. Q2. What are the recommendations for the district re-alignment? *The sixth grade will be a part of the elementary school program. *Colorado Elementary will no longer be a K-5 school, but will become the district’s preschool center. *Central Middle School and West Middle School will operate with grades 7 and 8 only. *Colorado Elementary will become part of the Madison Elementary attendance area. If Madison would not be the best choice for a family, Colorado parents will be given first priority for any open grade levels in the other elementary buildings for in-district transfers. Central Middle School will close and all 7th and 8th grades will be located at West Middle School. Q3. Why is Colorado being considered for the Early Childhood Center? A3. The student population and the size of the building were key factors in this recommendation. Colorado is the smallest elementary building by enrollment and square footage. Madison became a likely partner for our Colorado students as it is one of our larger buildings for space but also has a smaller student population. Q4. Will there be an increase in class size due to change with Colorado? A4. Class sizes across the district vary by attendance center. The goal of the district is to have more uniform class sizes. The district will struggle to maintain class sizes below 18 during a time of declining enrollment. By having more sections of a grade level in a building, there is typically a greater chance to even out classroom assignments. The district will be retaining the teaching staff so the capacity to avoid large class sizes should be able to be addressed. Madison would have three sections at each grade level. There will be room for additional students at Franklin, Grant, and Mulberry Elementary buildings if in-district transfers are requested. In-district transfer requests for the 2019-10 school year for Colorado families will be made available by the end of this calendar year. Q5. Would busing be available for impacted Colorado students? A5. Busing will be provided to students that currently qualify or would qualify with the new placement at Madison. Transportation guidelines will follow current policy for parent requested in-district transfers. Q6. Is there space in the elementary buildings for sixth graders? A6. It is anticipated that there will be space available in each building. Legat Architects did a building analysis and concluded the recommendation is manageable. The one exception is McKinley Elementary. McKinley is slated for an addition that would begin in 2019 to relieve the tight fit. The McKinley staff felt it can accommodate for the short term. Q7. What will happen to the Central Middle School Building? A7. There have been discussions with developers for the next use of the facility. The district has a firm commitment that the auditorium and the gym are preserved for community use. Q8. How will music education be facilitated in a new alignment? A8. Muscatine CSD has made a $1-million-dollar commitment to the music department this year. Teachers have been in discussion for some time about how to make a strong program even better. MCSD is confident the music program will continue to grow and thrive . Practice space and storage are always a concern and everything possible will be done to continue the support of the program. Q9. Will there be wrap-around services for preschool students? A9. The intent to provide a full school day program every day within our preschool program would be enhanced with wrap around services. A day for the preschoolers would include preschool instruction by a certified instructor and some time in quality day care provided by para-professionals. The time before and after the school day could include a fee-based model that is part of the school system or part of a private service operating out of the early learning center. Those are details that will need parent input to gauge need. Q10. Will 6th graders have access to exploratory courses? A10. A team of teachers and building principals will be meeting to outline the 5th and 6th grade program. Electives, including academic electives, will be part of that discussion. The group will have the charge to improve the program for both grade levels. It should also be understood that year one is a starting point and a learning time for students and staff. Q11. How will staff transfers be handled and will there be layoffs? Done by district-wide seniority (date of hire). Displaced employees have first choice of open positions. Retirement Incentives have been approved by the board with a closing deadline of December 20, 2018. Create a List of known openings once retirements/resignations known. Create a list of displaced employees with district-wide seniority date. People from displaced building have choice of openings before other district employees. Displaced employees will not have to interview for open position. Displaced Employees must be fully certified for open positions to be placed in open position. A meeting will be held with all displaced employees to choose new position. Employees must be present to choose. The employee with the most district-wide seniority choses first and so on through the lists until either positions run out or all displaced employees have a position. If after choices are made and there are still displaced employees without an available position those individuals will have first choice of next available open position following seniority order list. No interviews required for these positions. If after choices are made and there are additional open positions they will be opened to the rest of the district employees following regular contract transfer procedures. Displaced employees will have the one opportunity to move to an open position with no interview after placed if another open position occurs then employee would need to follow regular contract transfer procedures.